Haitian president Michel Martelly replied to allegations made by former president Jean Bertrand Aristide that there is a hunger problem in Haiti and that those in power are not doing anything about it. Regarding Aristide's comment about LAVALAS sweeping the next elections in Haiti, Martelly says: "It is the dream of every political party or any leader." In this pre-election season in Haiti, tension is starting to build up between the Martelly presidency and the LAVALAS party of Jean Bertrand Aristide. That is the kind of regrets all our old leaders are. And about the population, it is not something new about them. Now all Haitians know that they have a president. So we are not going to worry about it. My president please keep doing what you are doing with your prime minister. It's all politics and that is what is wrong in Haiti. Leaders and political parties in the past only do for or mention "the Haitian people" when it serves their selfish purpose. Change is not easy and we will not see overnight results. I have just recently returned home from time spent in Haiti. I can't speak on what President Martelly is or is not doing about the problem of hunger in Haiti. It is a great problem and would love to know that something is being done. 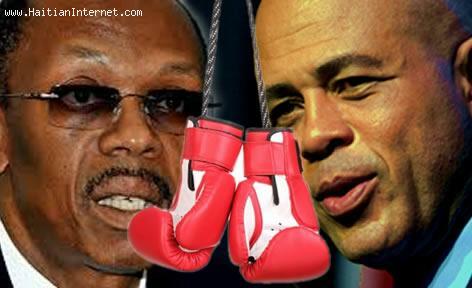 As far as Martelly vs Aristide. Best leader for you but not for the Haitian people. I don't the so-called president Haiti has now but Aristide is far worst then this one. Aristide is very bad for Haiti. Everyone knows that, president Aristide is the best leader in Haiti.